Well its a little bit of a different story than last year. This year the forcast was for SE 10-15 mph and that just don't work from a 19' boat in Hatteras Inlet. Last year the wind was NE which has the inlet and the fishing grounds blocked by land.We caught a bunch of rays and sharks. We saw a small hammerhead swimming in the water. We caught spanish mackeral and bluefish. 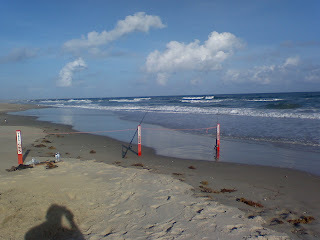 I never saw any cobia and I think only a few were caught while we were there. The only drum we caught was from the surf on sunday afternoon. We will be back next year to try again. No I didn't catch it. 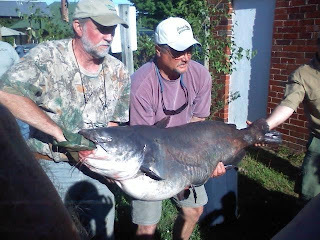 Two guys caught this earlier today and had it weighted in and certified as the new state record at Green Top today. I think the official weight was 102.5 Pounds. That's an amazing fish and I am glad the James River has broken the 100# mark. Now we need to get that World Record!